Smartphone cameras have steadily improved over the years, but if you’re trying to pull extreme close-ups or other artistic flourishes you’ll still likely be disappointed. Thankfully, this Clip and Snap Camera Lenses Set frees you from the shackles of factory-setting image quality — for good. You can take capture stellar smartphone images you’d never thought possible with these easy-to-use lens for 75 percent off from TNW Deals. In your set, you’ll get five different lenses that easily slip over your phone’s camera, each unlocking a different range of picture-taking choices. Easily capture your entire field of vision with the wide angle lens, or get in tight on your subject with the macro lens. Or go with the fish eye lens and distort reality to amazing artistic effect. The telephoto and polarizing lenses round out the set to respectively zoom into faraway details or capture glare-free images — so you’ll have all you need to take creative pics wherever the urge strikes you. And since they’re ultra-portable, you can throw them into your bag so you’ll be ready to turn an average image into a work of art at any moment. 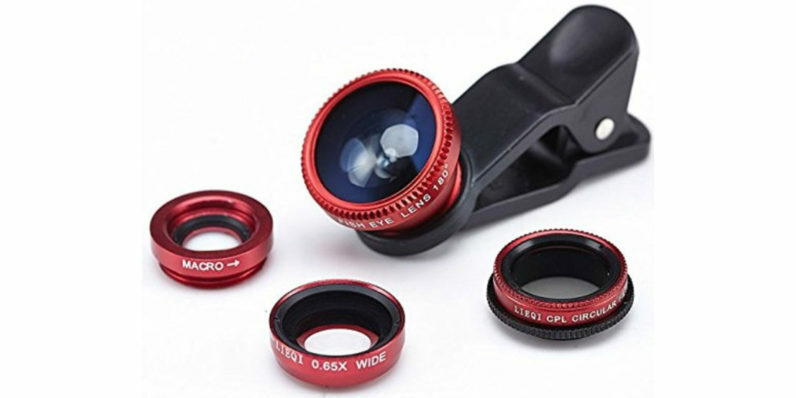 The Clip and Snap Camera Lenses Set usually runs almost $100, but if you act fast, you can score this it for only $23.99 from TNW Deals. Choose from three different color variations (black, red, and blue) to fit your particular style.